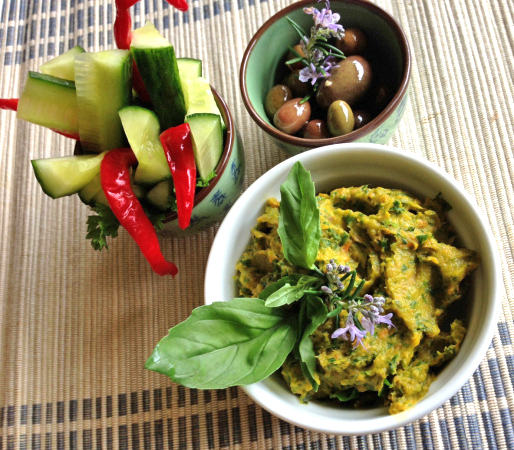 Roasted carrot, parsnip, basil and parsley dip with olives, cucumber and pickled chillies. wash and cut in to 2.5 cm thick slices both the carrot and parsnip. place vegetables in a small heavy based baking dish, sprinkle with salt, pepper and rosemary. add 2 table spoons garlic infused oil and toss vegetables well. place in a pre-heated oven at 175 c for 45 mins or until cooked through and slightly caramelised. roughly chop the parsley and basil and place in blender. add the lemon juice, remaining garlic infused olive oil and the water. add the cooled baked vegetables and blend until smooth. 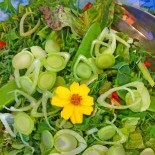 Use simply as a dip with sticks of cucumber, a few pickled chillies and olives. Makes a fantastic topping for any baked or steamed vegetables. Spread on crackers or fresh bread. Add to a small amount of quinoa and use as a stuffing for tomatoes, zucchini or bell peppers.